Key Syetem 271 on WRM track. 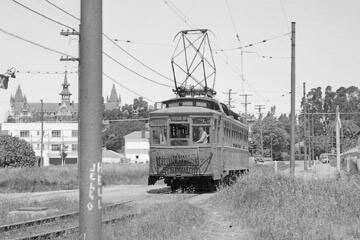 Key System 271 is a wood and steel, deck-roof, double-truck, double-end, streetcar intended for suburban service. 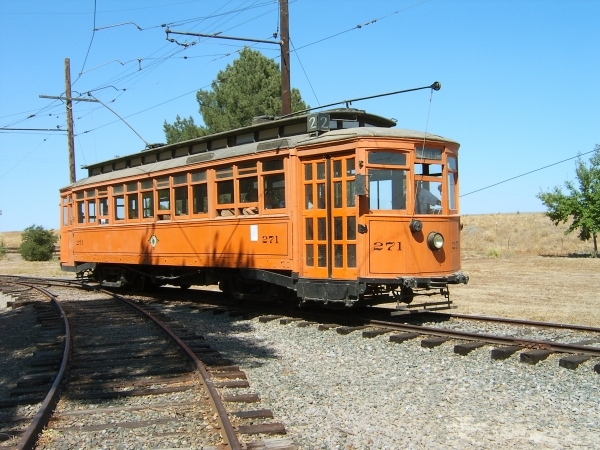 Car 271 was built by the St Louis Car Company in 1901 for the Lehigh Valley Transit Company in eastern Pennsylvania as their 139. Lehigh Valley got into financial trouble and had to sell some of their new cars. In 1904 the Oakland Traction Company bought 18 of these cars. On the Oakland Traction Company this car was numbered 251. 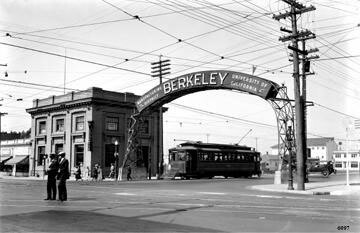 These cars were used on the Richmond to Oakland line. It became Key System 271 in one of many cooperate changes that the East Bay transit system went through. Like many cars that lasted as long as 271 did, it went through many changes in its lifetime. It was built as a two-man car with wooden siding, three compartments, and gated platforms just wide enough for one person to enter at the rear and exit at the front. Today it has steel sheathed sides, large platforms with double folding doors and a single compartment. For part of its life it was equipped with couplers to pull a trailer. It was also equipped with a pantograph for a short time for one special service it was involved in. This car was purchased by the Association in 1946 and was the first car in the collection. It was purchased not only to preserve it, but also so it could be used on chartered fan trips. To get a little more speed out of the car, the Association had the Key System change the 40 horsepower GE 70 traction motors to 65 horsepower GE 201 traction motors. Car 271 arrived at the Museum in November 1963. Owners: Key System 271. Lehigh Valley Transit Co. 139. Oakland Traction Co. 251. 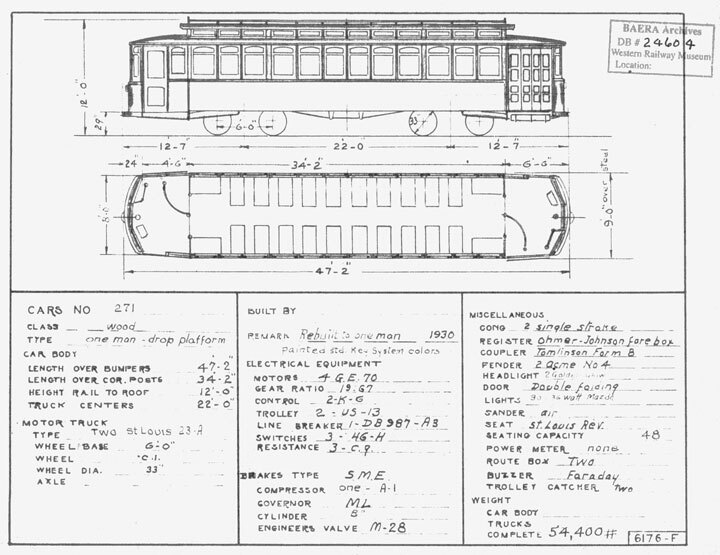 Technical Data: Standard wood and steel streetcar. Built by St Louis Car Company in 1901. Seats 48 passengers. Weight, 54,400 pounds. Trucks: St Louis 23-A. Wheels, 33”. Axle, 5”. Journals, 4” X 6”. Traction motors, 4-65 horsepower @ 600 VDC, inside hung. Air Brake Equipment: Westinghouse Traction Brake, SME. Motorman’s valve, M-28-D. Emergency valve, D-1. Double check valve, #15. Brake cylinder 8 X 14. Main reservoir protection valve. Dead man on controller and foot valve, LB-4. Governor, GE type MC. Air compressor, CP-27. 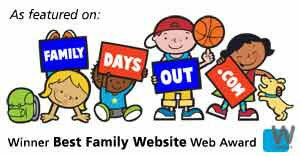 Dimensions: Width: 8’ 4”. Length over buffers: 47’ 2”. Height: 12’ 0”. Truck centers: 22’ 0”. Truck wheelbase: 72”. Propulsion Equipment: General Electric type K. Controller, K-6. Deadman equipment, LB-4. Traction motors; GE 201. Control switch, MS-46. Line Switch, DB 987. Power resistors, GE type CG. Misc Data: Trolley wheel, 6” More and Jones. Trolley base, US 13. Trolley catcher, Ideal made by The Trolley Supply Company of Canton, Ohio. Current Condition: This car is in the condition as it came out of service. There is deterioration on the platforms that should be resolved. It is complete and operational. Proposed Future Treatment: Car needs to be repainted and a new canvas roof installed. Due to its original condition, there is reluctance to make too many improvements in its appearance. The current plan is to repair the rot in the crown sills and maintain it in its current condition.